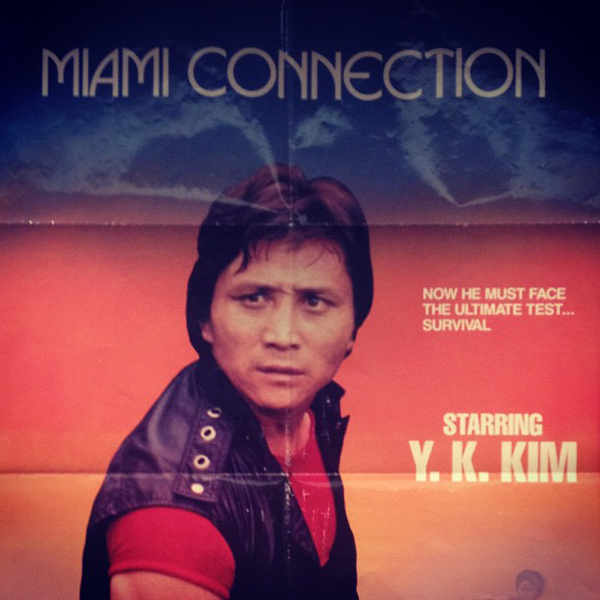 Last night was the much anticipated screening of Miami Connection, highlighted by a live appearance by Grandmaster Y.K. Kim. And it was, as expected, pretty much the greatest thing ever. BTW, never heard of the Grandmaster before? Well, this video will help get you up to speed? fort90: First off, it’s a real honor being able to meet you Grandmaster! Am a HUGE fan of your work. Now, did you ever expect, upon completing Miami Connection, that people in a packed New York City theater, on the hottest night of the summer, would still be enjoying your movie 25 years later? Kim: I was shocked! And overwhelmed. I never expected that, after 25 years. I failed actually… temporary. But last night, the audience is laughing, and clapping, and screaming! Wow, what is this?!?! After [it] finished, everybody asked me the same thing: when is there going to be a sequel, Miami Connection number two? It was great. fort90: Well, because today’s audiences are immediately head over heals, and with the impending re-release looking very successful, have you thought about doing a sequel? Maybe you’ve heard of it; there’s a thing called Kickstarter, and after last night’s screening, all my friends said they’d put money towards seeing Dragon Sound’s world tour! Kim: [laughs] My organization, called Martial Arts World, a very successful organization? We have a plan. We will create unique and exciting action films every year. One movie a year, within five years. fort90: Now, will taekwondo be prominently featured? Since after all, it is the best. Kim: They will have what we call Martial Arts World, modern martial arts. It’s traditional plus modern. It’s not just kicking and punching, it incorporates modern philosophies. If you practice martial arts, you can be healthier and stronger, plus smarter and wiser. And have internal strength, so you can have real self-confidence. When a student comes, we teach actually how to be rich. Because 85% of Americans, they live paycheck to paycheck, even though this is the richest country in the world. So we teach how to be a leader, so they can have personal freedoms, a person of power. Anyone who practices martial arts can have a truly successful life, that’s modern martial arts. fort90: When you first came to America, some 30 years ago, did you envision all this happening? That you’d be teaching martial arts, have a successful business, be a motivational speaker, write a bunch of books, make a movie, etc. Kim: I was very fortunate. I had big, bigger than anyone else’s, dreams. I wanted to change the world. When I started martial arts, taekwondo was a turning point in my life. And I knew it can help millions and millions and millions change their lives too. So I set the ultimate goal [of sharing martial arts, what I learned], which I have achieved. fort90: Can you talk a bit more about Miami Connection’s own connection to another martial arts masterpiece? LA Streetfighters [which was screened at NYAFF 2010]? Diamand: The story of Miami Connection starts with [co-director] Woo-sang Park, who was the director behind LA Streetfighters. Grandmaster Kim wasn’t really associated with that movie, except with his connection to director Park? fort90: I see. I keep hearing different things, so I’m confused? Diamand: And you’ll hear even more, so it’s good that we can straighten it out. fort90: So how did you meet Park exactly? Kim: I was the most successful martial arts leader in the US, perhaps [the] world. So when I went back to Korea, I was on the most popular talk show. At the time, director Park, he flew down to where I lived in Central Florida. He asked me, ‘Hey, why don’t you be a partner and produce a movie.’ So I said right away, ‘Yes!’ Because I wanted to promote martial arts on the big screen, like a Bruce Lee. But they could not stop me, so I started it. But they were right; I was physically, mentally, financially, totally exhausted. And I was waiting for failure, so I had to ask myself, what should I do? And my heart told me, ‘You do not have that word, that specific word, failure, in your dictionary, in you life.’ So I struggled, against millions of obstacles, and overcame them all to finish the movie. fort90: Did you have any experience making a film before? Kim: I didn’t even know what a movie means. We didn’t even have an actual script. Just a storyline that we developed as we went along. fort90: Now, from what I’ve heard, you Grandmaster Kim and director Park had a parting of ways, so he took a portion of the film to Korea, and you filled in the blanks here? Kim: Director Park and me had a partnership. So he had the responsibility for Korea; I responsibility for the US and the world. So after I finished the movie, he took his copy and he left. Diamand: We showed the film to many Hollywood studios, knocked on all these doors? this is the original cut, and its original title? and everyone who saw it basically said the formula doesn’t work, because it was a very sad ending. So I came back to Florida. I didn’t know how to direct, I didn’t know how to write. So I asked Joseph Diamand, who is now Master Diamand, to re-write and re-film and re-edit and re-mix. Because, before, Jim [played by Maurice Smith]? he died! Main character, he dies, and the bad guy, the white ninja, he’s alive. And no body liked it. So we totally changed things. Diamand: It’s an uplifting movie, and we wanted to have an uplighting end as well, which was also consistent of injecting Grandmaster Kim’s philosophy without changing the basic structure. It’s a little bit more about his mission in life, and at certain points of the movie, especially at the end, you can pick up on that. The really interesting story is how, between the time the movie was made and now that it’s been rediscovered, Grandmaster Kim has really revolutionized all of martial arts. fort90: So there’s an earlier, completed version of the movie, floating around Korea? Has it ever been shown? fort90: I know there was plenty, but what was the one biggest challenge of making the film? Kim: Biggest challenge was the mental aspect. I had to do ten people’s jobs: directing, story, acting? casting, locations, even catering. It was crazy! One time I didn’t sleep for five nights. I have very strong spirit, but my body couldn’t follow it. So while driving, my car ended up in the ditch! I was lucky enough to be alive. fort90: And conversely, what was the most enjoyable part? Kim: I have learned that nothing is impossible. To have spirit, indomitable spirit. And second, most important thing I learned, was that without my students’ teamwork, and the community of Orlando, without their support, I could not finish it. They supported me more than I expected. fort90: And it definitely shows; you can tell that everyone involved Miami Connection is in it together. There’s a real sense of team spirit. I must ask: how did the relationship with Drafthouse Films come about? Kim: I don’t know why, but one year, two years ago, people started making a lot of requests. TV stations and film festivals? they all wanted interviews. And refused; I didn’t want to be involved. Kim: My memories was a nightmare. Like a life and death situation that I had. It almost caused me to go bankrupt. I wanted to spend my time promoting Martial Arts World. And this company, Drafthouse, they called and emails many times. For six month; it was a little weird. So we responded, and this all happened. fort90: I’ve been to many screenings, with the people behind it present, and when their movie gets laughs unintentionally, I somewhat feel bad for the director. And there were parts last night in which the audience is laughing at something that’s clearly supposed to be serious. Did you have any problems with that? Kim: I didn’t have any problems with that! That was great! fort90: The DVD and Blu-ray comes out later this year; will there be any extras? Kim: We it will be very, very exciting. I think it will be incredible. fort90: Will there be any motivational content, similar to what can be found in your books and DVDs, plus what you do on stage? fort90: Excellent! Last question? is there any good Korean restaurants in Florida? Kim: Oh yes! Korean food is good! When you come to Orlando, we will take you out to have good Korean food there. Miami Connection will have a limited engagement return to the big screen, followed by the aforementioned DVD and Blu-ray editions, plus a digital release, later this year. Till then, stay tuned for additional New York Asian Film Festival 2012 coverage, which continues all week!